One of my favorite things about Easter is choosing a sweet bread or pastry to bake for the occasion. Over the years, I’ve made various coffee cakes and filled, yeasted breads. I’ve made hot cross buns and other sweet rolls. And, this year, I pulled out a recipe that had been waiting in the files for a few years. 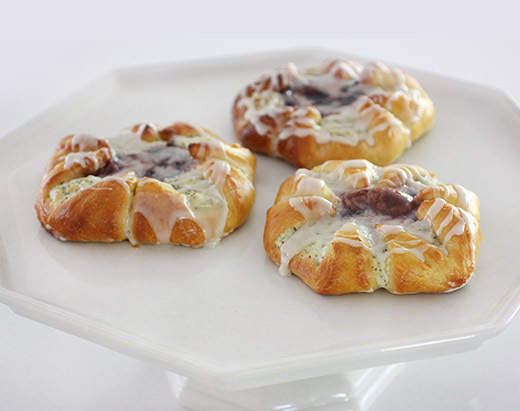 The recipe for these danishes is from the May 2011 issue of Living magazine. I do love finding a gem like this in the files. Of course, the day couldn’t be about sweets alone even after weeks of Lent with no sugar. I also revisited a quiche recipe I made a couple of years ago and this time served slices of it with roasted asparagus. It’s a tall, grand quiche with a light and fluffy texture. I feel like it deserves a special occasion but would enjoy it on the menu regularly. But, back to the danishes. They were just rich and indulgent enough. The pastry dough is easy to shape, and the cut and folded corners were to make each one look like a flower with curved petals. They’re made with two fillings. First, a cream cheese-poppy seed filling was spread in the center and then a little dollop of cherry preserves was added on top of that. I found some cherry preserves made with apple juice rather than sugar and that helped keep the overall sweetness in check. The dough was started with warm milk, butter, and sugar. Yeast, flour, and salt were added, and the dough was mixed with a dough hook in a stand mixer. Eggs were added, one at a time, followed by more flour. After kneading the dough a bit more by hand and forming a ball, it was left to rise for an hour. The first filling was made by mixing room temperature cream cheese with confectioners’ sugar and vanilla. An egg yolk and poppy seeds were added and mixed to combine. The dough was then rolled into a big square and trimmed to 15 inches on each side. That square was cut into nine smaller squares. Each square of dough was then cut with a two-inch line from each corner toward the center. The cream cheese filling was spread on the center of each, a spoonful of cherry preserves was added on top of the filling, and the corners were folded up and into the center of each. 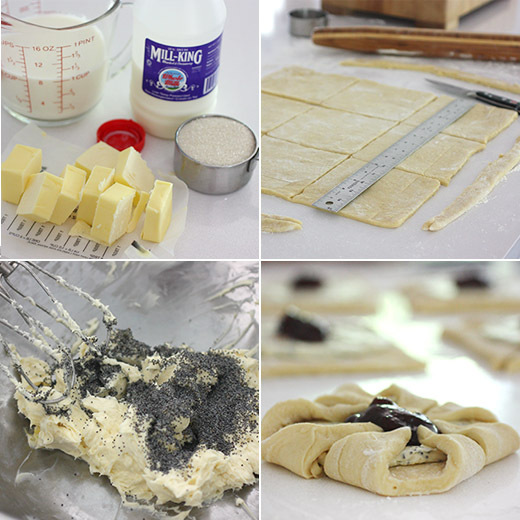 The folded dough was brushed with egg wash, and the danishes were baked for about 18 minutes. After cooling for a few minutes, they were drizzled with a confectioners’ sugar glaze. The cream cheese filling with the spoonful of cherry preserves made these irresistible. And, the tender pastry dough bakes into a golden, puffy, light, delightful treat. This is going to be a hard one to beat next Easter. I might have to start repeating myself rather than trying something new each year. A fantastic treat! 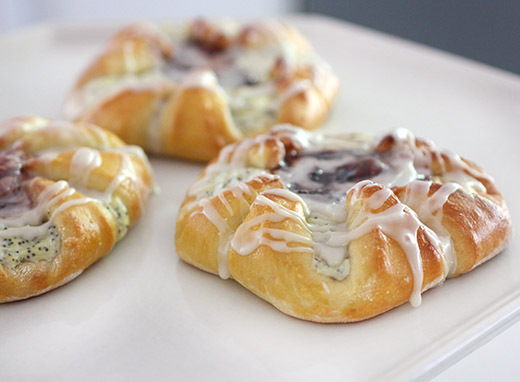 I love Danish pastries. beautiful! of all the pastries you might've chosen to make, these are probably the loveliest! So lovely, especially the filling! Our family tradition for Easter is homemade cinnamon rolls. I would love to switch it up with something new, this wonderful recipe just might be my chance. Hi Lisa, you did such a fantastic job with these, they really are showstoppers. Love, love the filling. What can I say but that these look like the perfect danishes!! I love cherries and cream too :D Such a pretty pattern they form too. wow! I love the cheese cream filling! Totally the best one! They all look so perfect!